This Institutional Review Board approved study describes the quantitative changes of the electroencephalogram (EEG) due to 30 – 80 mA of Alpha-Stim cranial electrotherapy stimulation (CES) and the concurrent use of CES in 3 neurofeedback (NFB) sessions. 12 normal male subjects between the ages of 20 – 50 were tested. Subjects were right handed and right eye dominant. They had no previous head injury requiring medical attention, no history of epileptic seizures or convulsions, were never treated for insomnia or depression, and were not taking psychoactive prescription drugs. Instrumentation methods to acquire artifact-free EEG during CES were developed and compared. A noise-cancellation technique was used to eliminate CES noise from the EEG. Each subject underwent a double-blind, crossover design under five treatment conditions: 1) Sham/Control (no treatment), 2) 0.5 Hz CES, 3) 100 Hz CES, 4) 0.5 Hz CES/NFB, 5) NFB. All treatments were administered to each subject for 20 minutes on different days. Occipital EEG data was acquired before, during, and after the treatment. From the processed EEG data, 22 different parameters were analyzed for changes due to the various treatment conditions. Among these parameters was a newly developed alpha modulation index. The alpha modulation index delineates the characteristic waxing and waning of the alpha rhythm from the more general case of alpha activity using a method based on complex demodulation. The index performed well when applied to simulated and physiological data. Thorough statistical analyses were applied to each experimental EEG parameter and treatment relative to the sham control. Each of the four types of treatment was compared with the controls on a paired t-test. A 22 ANOVA factorial design compared each of the four treatment conditions against each other. A time analysis of variance was also computed for each treatment against the controls to partial out any effects from the position in the study at which subjects received each treatment. The principal experimental results indicate that both the 0.5 Hz and 100 Hz CES significantly shift the alpha band power distribution downward in frequency relative to control as shown by the alpha mean frequency variable in the EEG. 100 Hz CES also significantly reduces the relative amount of beta band power over time relative to control. NFB alone shifts the beta band power frequency significantly upward relative to control. There is a significant inverse interaction in the alpha index parameter during the combined CES/NFB treatment nullifying the increase in the parameter from each treatment alone, however the combined CES/NFB treatment may cause an increase in the physiological DC potential of the EEG. These findings suggest that Alpha-Stim CES elicits changes in the EEG that are quantifiable and beneficial to people with stress related disorders. The author concluded that the fact that both 0.5 Hz and 100 Hz CES, two completely different treatment parameters, showed significant changes from pre to post treatment for the same variable lends strong support to the claim that the effects seen are real. No negative side effects were found during or following the study. No subject left the study early, nor did any complain about any study parameter during or following the study. 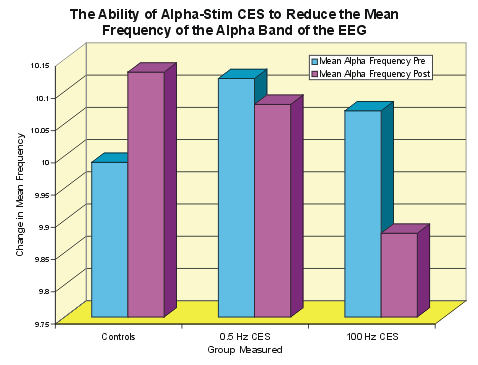 The graph shows that Alpha-Stim CES significantly reduced the alpha frequency of the EEGs from pre to post treatment when compared with the controls. The graph shows four different EEG parameters that are related to reduced stress and a more relaxed state. The F-Score value comparisons with the control group are shown. 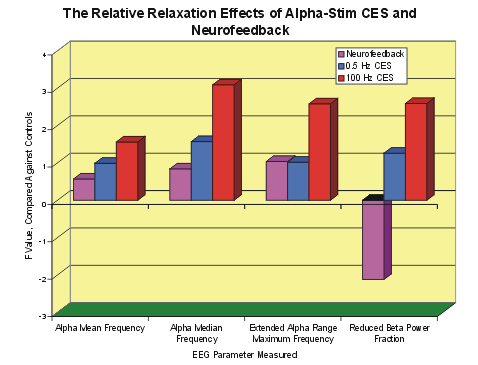 It can be seen that while the Alpha-Stim CES was very effective in reducing stress in this patient group, neurofeedback was insignificantly helpful, and the beta power fraction actually increased in that group.